Architecture has always been a reflection of nation’s customs and traditions. According to Robert Treat Paine et. al. (1955), ancient religious architectural monuments of Japan are Shinto and Buddhist places of worship like shrines, monasteries and temples. Temple architecture in Japan began to develop shortly after the spreading of basic doctrines of Buddhism in the middle of the VI century from the Korean state Paekche. Buddhist belief was not only a new and very profound philosophy for Japanese, but one of the most impressive examples of a developed culture of the Asian continent. By the end of the VI century Japan has built up impressive monasteries based on the continental model, and by mid-VIII century it has developed a national system of building temples. Pagoda was the main element of Buddhist religious architecture. Like other buildings of the temple, this element was complex because of the sculptural and pictorial images saved as a real line with the ideas of faith. During the classical (VIII-XII cc.) and the medieval (XIII-XVI cc.) periods Buddhist architecture was leading in introduction of new structural and ornamental features. Thus, the Buddhist structures were crucial not only for Japanese architecture, but also for all Japanese art (Paine, et. al., 1955). Shinto, or “the way of the gods”, was a common Japanese religion. The roots of its architecture were dated back to the origins of Japanese civilization. Shinto temples had their own unique forms. For example, the construction of the magnificent sanctuary of Ise embodied the best of Japanese traditions even though different aesthetic simplicity that drew the most ancient forms of architecture (Paine, et. al., 1955). Plans for a larger number of Shinto Shrines acquired mature form only in the VIII because at that time Japan was already under deep influence of Buddhism, which led to the close connection between two religions in the history of architecture. Thus, the temple Toshogu Shrine in Nikko, the mausoleum of the first Shogun Tokugawa, looks, as a Buddhist structure at first glance because of the thin ornament, though it is Shinto. Shinto was formed long before the acquisition by the Japanese written language and had no sacred books of the prophets or the founders of the doctrine (Metevelis, 2002). There is no doctrine itself, which is a characteristic of paganism. In Shinto Gods, or kami in Japanese (which literally means “the one who is above”), were everything that could have a soul. Later, a certain dogmatic base was made up because of the influence of Buddhism. Animist religion worships not only anthropomorphic deities, but also attributed elements of nature, especially certain mountains and trees that inspire awe. Early shrines did not have the monumental architecture of late Shinto structures. For some shrines like the sanctuary Miwa (Nara Prefecture) and Kanasana (Saitama Prefecture) the main object of worship was a mountain. Even today they do not have a building that could be attributed to as “main hall” (honden). They are enclosures that are considered sacred sites. This is usually a rectangular area covered by pebbles, surrounded by stones and by a bunch of straw, which connects the four corner posts. Indeed, the center of the sanctuary Miwa is a massive rock on Mount Miwa. Sometimes in the middle of such a sacred place there is a stone (Iwasaki), or pole, or a tree (himorogi). At the base of the mountain is a small hall for worship (hayden) and Torii – specific poles and gates, that mark the Shinto shrine. The existing complex had shrines constructed in order to pray the gods for a bountiful harvest, or to express gratitude for good crops. These earliest places of worship – shrines prototypes – were found in the center of the village or near mountains, boulders and other places where, as people believed, gods lived. These shrines were simple pits considered to be the guardians of life and prosperity. Their original design featured a temporary nature. Their form was unknown, but one can assume that they were similar to the shrines Mikos, transported on poles during the holidays in honor to increase harvest. For example, placement of sanctuaries Kasuga and Camo on the rocks suggests that they originally were there (Rynolds, 2001). There is tendency for all Shinto temples’ layout. An important part of Shinto religious architecture is the gates to the temple called Torii (Japanese Architecture, 2009). Torii are arches, resembling a Greek letter “?” with two beams. The upper beam is longer and slightly concave than the other one. Previously, they were built only of wood and always painted in red. They were followed by a steam statue “Korean dogs” that suppressed evil spirits. A common Shinto temple complex consisted of two or more buildings. The main building designed for kami was called honden. A hall for prayers was called hayden; this was the place for an altar (Japanese Architecture, 2009). In the main room there was Xingtai (literally it means “the body of Kami”). It was believed that the soul was infused in Xingtai kami. Body of kami could be a stone, a tree branch, a mirror, a sword, or a wooden plaque on which is written the name this god. Besides the two main buildings of the temple complex, there could be included other auxiliary structures such as a hall for offerings, sinsendze (a place for making sacred food), syamuse (a space for an audience), haraidze (a place for spells), kaguraden (a stage for dancing), etc. There were special pools for ritual washing of mouth and hands between Torii and honden. In mid VI century Japan established as a state. At the same time, Buddhism has spread in the country – a world religion that came to Japan from China via Korea. Buddhism became the vehicle of not only the new ideology of society, but also new forms of art (Slessor, 2001). The penetration of Buddhism into Japan, which was connected so important to the medieval art of human perception of unity of spirit and flesh, heaven and earth, was reflected in the development of Japanese art, particularly architecture. Buddhism brought to Japan not only new architectural forms, but also new technology development. This brought development of a special layout of the temple complex for Japanese temple construction. The most important technical innovation was the construction of stone foundations. In ancient Shinto buildings, the whole weight of the building was from dug into the ground in piles, which, naturally, limited the size of buildings (Cram, n.d.). Starting from the Asuka period (552-645), roof with curved surfaces and raised angles were spreading. Today it is impossible to imagine Japanese temples and pagodas curved roofs from the Asuka period. Buddhist temple complexes differed in layout depending on whether they were built in the mountains or the plains. 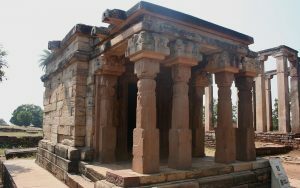 Those temples that were built on the plains had symmetrical arrangement of buildings. Temples that were built in the mountainous terrains were not symmetrical. Therefore, architects had to find a concrete solution every time to the most convenient arrangement of buildings of the temple complex (Coaldrake, 1996). Covered galleries along with the temple gates often represented a notable architecturally separate building. The complex also included living quarters for monks and a dining hall. 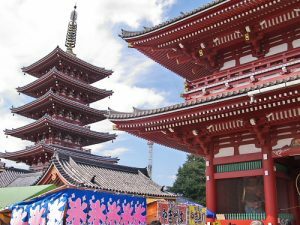 Architecture of temples in Japan reflects the historical development of the state. Temples of Shintoism and Buddhism influenced each other from the beginning. The construction of temples was rethinking in the visual-sensual form of the major tenets of doctrine. Shinto gods led nature and the fate people while Buddhism provided peace in the country. Above all, a temple had to symbolize ‘a house of God’, and the architects did everything in order to deliver these feelings to peole. First building of temples was concentrated on large size and strength. Later they had more artfully decorated interior and exterior details. The development of religious thought and spreading the faith is closely connected with the construction of temples. Also, depending on the type of governments, ruling in a given period, the temple complex bore those imprints. The protection of a supreme class partly determined stylistic characteristics of the buildings in the monastery ensemble. Thereafter, when the country is actually ruled by the military class, the church was inclined to trend higher decoration of external and internal parts of the structure.